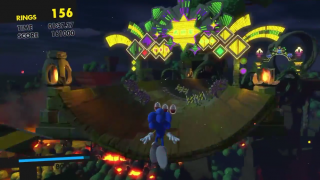 Luminous Forest is the seventh stage of Sonic Forces and the third stage to be played as Modern Sonic, featuring a new setting in a moonlit ancient forest called Mystic Jungle that is undergoing deforestation and burned by the Eggman Empire to build a casino. After the raid on the Arsenal Pyramid, Sonic hurries to Luminous Forest after having received news from Amy that Silver is currently fighting Infinite in the Mystic Jungle. Upon arrival however, Sonic receives news from Knuckles and Amy over the radio that the Eggman Fleet is scattering bombs all over the place, putting the local Resistance forces at risk. Observing the jungle going up in flames, Sonic assures the despairing Resistance soldiers that they have done plenty, and promises to make sure that the soldiers' efforts were not in vain. Luminous Forest begins with a linear 3D section with multiple Speed Boosters and easily-destructible Egg Pawns and Egg Walkers, quickly leading to a 2.5D section where the path diverges into two others, both leading to a platforming section. While the lower path is more dangerous, requiring precision and leading to a loop, the upper path can be simply passed using a Boost to pass over the loop, thus the path converges back to a 3D section resembling a half pipe with some obstacles and shortcuts that require the use of the Homing Attack. After another half-pipe-like section, a quick-time event takes place where Sonic runs over a giant snake and is then swallowed. He will then fight for his life, requiring the player to press the Jump button when the green rings appear, releasing Sonic through the snake's mouth to the end of the level. This page was last edited on 20 May 2018, at 13:38.